✔EASY TO USE - 2 switch buttons to control; One for power, another for 8 modes choose. ✔AUTOMATICALLY - Exposed to sunshine during the day, and it begins to light up at night automatically when power on. ✔LONG WORKING TIME - Continuously working for 8 hours at night once single fully charged. 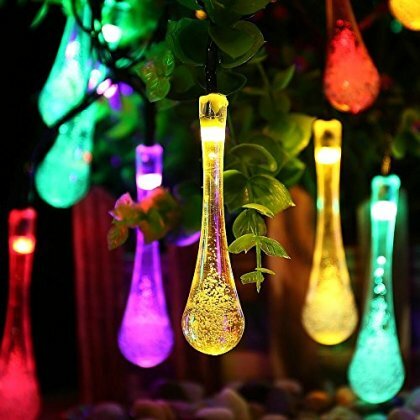 ✔SPECIAL APPEARANCE FOR DECORATION - Special water drop like appearance makes your environment stand out. And create a cozy romantic and pleasant atmosphere to your garden, patio, lawn，gazebo, wedding or party etc.